Have you ever attended an event and known that you were part of something truly historic? That’s the way I felt when I attended the Douglas County TEA Party back in September of 2009, but it was nothing in comparison to what I felt last night at the latest and greatest Douglas County TEA Party, dubbed “Only In America”. Having attended a few TEA Parties since that first one (for me) in Douglas County, I thought I knew what to expect, but apparently I didn’t get the memo and I had no clue that things were going to be completely different this time around. 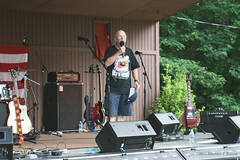 As a volunteer for the event, I had been part of all of the planning meetings. I knew (by way of those meetings) how much work was being put into this event, and I knew this TEA Party was going to be awesome. I just didn’t realize how awesome it was going to be until I arrived at the Clinton Nature Preserve yesterday afternoon. As I parked the truck I could see that some politicians had already shown up and set up their booths. 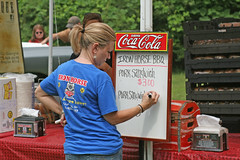 Iron Horse BBQ was set up and preparing to serve some of their delicious BBQ sandwiches, and the organizers, Maureen Miller, Brenda Bohanan, and Teresa Ott were running around making final preparations. 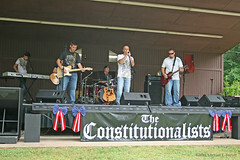 Members of the band, The Constitutionalists, were warming up, and you could feel the electricity in the air. Some say it was the storm that passed by just hours before the official starting time of the event, but I know otherwise. There was so much energy in the air, you could feel it. From the volunteers helping with parking to those helping to decorate the stage, everyone had an upbeat attitude and was working hard to make sure everything went off without a hitch. So, what was different this year? Everything. Well, almost everything. Last year there was an issue with sound equipment and people in the back could not hear the speakers, this year Sound Effects took care of the sound and made quite an impact. Needless to say, no one had a problem hearing the speakers, even from the booths farthest from the stage. Max Arnold gave a moving invocation to start things off and Dakota Kuykendall, keyboardist for The Constitutionalists, performed the National Anthem. 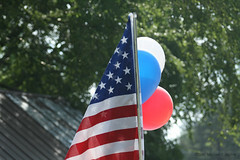 Maureen Miller welcomed everyone to the TEA Party and then The Constitutionalists performed live. 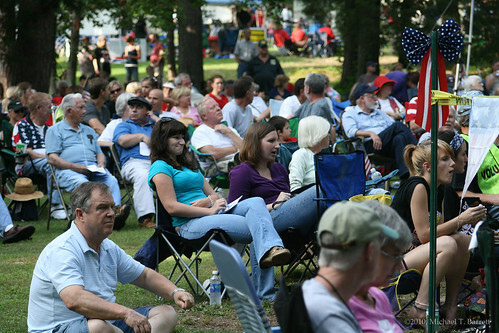 The band played some great music and really got the crowd fired up. By this point, the park was really filling up. Having been in the middle of the crowd last year, I could tell things were going to be much bigger this year. Why wouldn’t they be? At the last TEA Party some people were still under the illusion that the problems we were facing in our nation couldn’t get much worse. This time people knew better, so it was only natural that more people would show up for the event. Sharon White, a local Douglas County citizen with a clear message was the first speaker of the night. I’ve listened to a lot of people at a lot of political rallies, and Sharon rivals many of the best speakers I have heard in the past. Her speech was heartfelt and full of passion. She is a woman determined to make sure people know what their government is doing. Sharon’s speech was the perfect way to start the evening, and if Herman Cain would have been unable to appear as the keynote speaker, I have no doubt that Sharon could have handled the job quite handily. 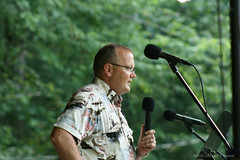 Current Douglas County District 4 Commissioner, and owner of Bud’s Benz, David Latham was the second speaker on stage. With a lot of thought, David decided not to seek re-election this year. He is walking away from his political position because it’s someone else’s turn to make a difference in the community. The people of Douglas County are lucky to have had someone as down to Earth as David Latham serving them for the past eight years. At one point toward the end of his speech, David asked “Where are the patriots”? 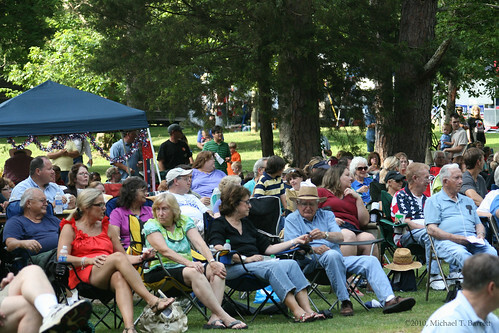 As far as I could see, there were about 3,000 of them sitting in the crowd at the Clinton Nature Preserve, listening to him. Both Sharon and David spoke about the problem with big government. 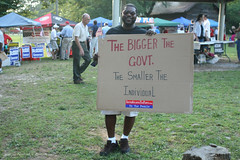 The TEA parties are held to protest big government, excessive spending, and out of control politicians. One big difference this year, was the lack of any mainstream media. The WSB Radio truck was there to record The Herman Cain Show, but none of the Atlanta based media outlets were on hand to cover the event. I was all over the park, all afternoon, and If they showed up I didn’t see them. Of course, last year the local Fox affiliate didn’t do a very good job reporting about the event, so maybe it’s a good thing none of them showed up this year. I was a fan of Herman Cain’s long before he spoke at last year’s TEA Party, and I was excited to find out he would be our keynote speaker again this year. One small detail escaped me, however, until he arrived at the park. I was right there by the stage and I was going to get the chance to meet The Hermanator! Sure, he’s just another citizen like the rest of us. Sure, he’s just a “local boy” there to support the TEA Party movement. Sure. Whatever. I was as nervous as ever when I got the chance to shake hands with someone as REAL as Herman Cain. It doesn’t get any more real than meeting a man like Herman Cain. 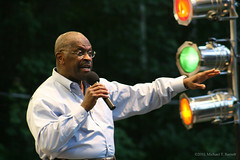 Herman took the stage, the crowd went wild, and we were suddenly at the beginning of The Herman Cain Show. That was another big difference this year. 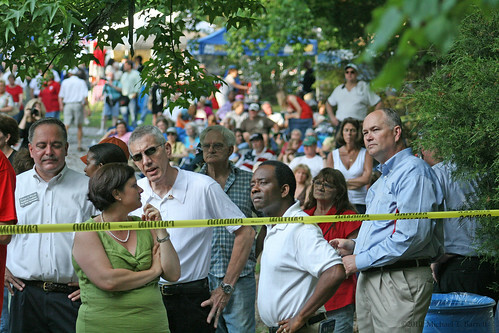 The original plan was to air The Herman Cain Show live from the park, but due to technical problems, they had to record the show instead. It will air during the week of June 7-11, so make sure you listen this week. If you have listened to Herman’s show in the past, you know that Friday is called “Rapid Fire Friday” where callers have one minute to ask a question and Herman has one minute to respond. After a brief speech about the ongoing problems with the current administration and the reality slap that things are indeed much worse now than any of us thought they could get, Herman began the Rapid Fire segment with members of the audience. Those asking questions did not have to submit their question in advance, they weren’t screened beforehand. No one knew what each person would have to say, let alone what they would ask, when it was their turn at the microphone. Concerns over Social Security and Medicare, a government out of control, and veteran’s issues were some of the questions at hand. 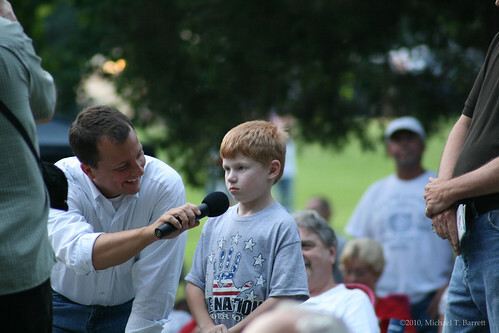 A couple people, including a young boy, asked whether or not Herman would run for President. 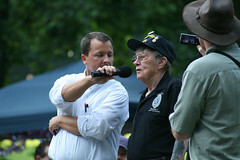 As things were winding down with the Rapid Fire segment, the last person to come to the microphone was a former Marine whose name was Lewis. He was worried about what we would teach our young people and began singing the final stanza of the Star-spangled Banner. You could feel the emotion in the air as people stood and placed their hands over their hearts. As I said before, you could feel the electricity in the air. As soon as he finished, Louis disappeared back into the sea of people, and many of us were left to dry our eyes. There are, in fact, four stanzas in the original version of the Star-spangled Banner. It’s a shame that most people do not know this, let alone the words in the other stanzas. No one could have planned a better end to the TEA Party than that. But it wasn’t over quite yet. As he wrapped up his speech, he explained what he meant by the fact he was in “prayerful consideration” in deciding whether or not to run for the highest office in the land. 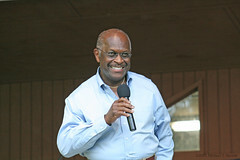 There is no doubt that Herman Cain is one of the most eloquent and intelligent speakers of our time. It was awesome listening to him, photographing him, and most of all, meeting him. I’ll be praying that God sends him the message he is waiting for, because in reality, we need more people like Herman Cain in public office. If there were, we wouldn’t be in the mess we’re in now. Last year I took over 200 photos and posted 33 of them to my Flickr page. This year I took more than 550 photos and 128 of the best ones are on Flickr. 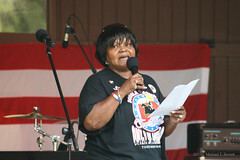 There are photos of the candidates and vendors, various shots of the crowd, and a few of Maureen Miller presenting “Brewmaster” Herman Cain with a jacket of appreciation. When I walked in the door after the event, I was exhausted. I was all over the park, all afternoon, and my feet were killing me. I had a headache for most of the day too, but I wouldn’t have missed the this Douglas County TEA Party for anything. I believe the only way real change can come to our country is to start at the local level, and it doesn’t get more local than a TEA Party, or any other political event, organized by local citizens. I truly believe that we, as ordinary citizens, can and will make a difference. Someone asked me the other day why I was involved in the TEA Party movement. I simply asked them if they were happy with the current state of our nation. As they shook their head in disagreement, I asked them why they weren’t.